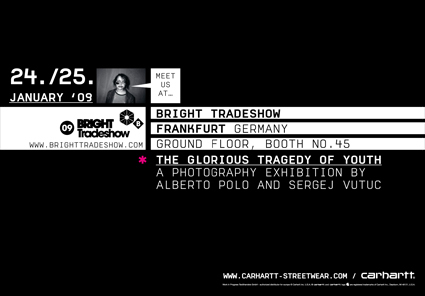 BRIGHT TRADESHOW FFM 24 &amp; 25.01.2009! The show is open daily from 10:00 to 18:00, our booth is No. 45 on the ground floor. 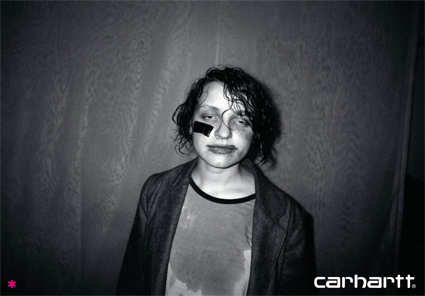 Apart from the new collection and special pieces like the Yama/ Carhartt Collaboration-boards designed by belgian artist ELZO, we will show “THE GLORIOUS TRAGEDY OF YOUTH“ – an exhibition by spanish photographer Alberto Polo and Heilbronn-based serbo-bosnian activist/ photographer Sergej Vutuc. Sergej will also be present with an own exhibition room of his gallery “Basementizid“, where he will show assorted work from artists he hosts in his gallery such as Phil Jackson. There’ll be live music and films as well!! If that wouldn’t be enough reasons to find your way to FFM, here are some more: Our friends from the skateboard museum will present their “Made for Skate“ book with an exhibition in the entrance area. Made for Skate is a 400 page book on the history of Skateboard Footwear and just came fresh out of the press, we are looking forward to see the final piece!! Also there’ll be a bowl contest again, this time hosted by Limited Mag. Alexis Zavialoff is organizing a “help for romania” group exhibition with Alex Flach and Adam Sello. The income of the sold pictures will go to the Bright Romanian Charity fund. Adam Sello will also have a space dedicated to his independent production “Anzeigeberlin“ in the entrance area.. Check some impressions of last year’s booth here. CARHARTT PIRATE BOAT IN VALHALLA!